The Manchester 100 is far removed from the head-down, hill-stuffed type of event increasingly prevalent in the sportive calendar. The event is part of the Bike Events annual series of sportives, aimed at raising money for charity as much as testing the legs. 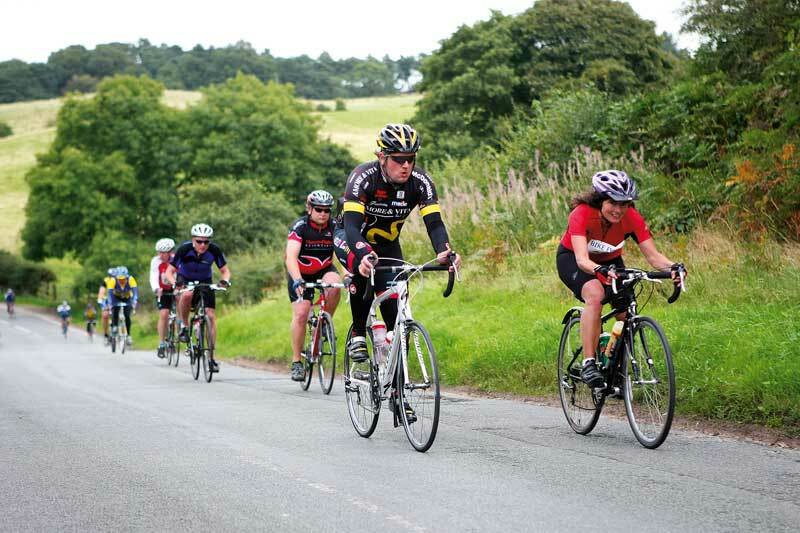 Consequently, the predominantly flat nature of the route on the Cheshire Plain, coupled with 60-mile or full-distance options, makes it ideal for a wide range of abilities. This was evident when turning up at the HQ in Wythenshawe Park, with a large complement of the whopping 2,500-strong field raring to get going. From the start, the route headed south on quiet and flat Cheshire country roads, travelling through the outskirts of Altrincham and Northwich towards the pretty Delamere Forest. The headwind in the first half proved the main obstacle in this event, with only a couple of short, sharp climbs and badly surfaced roads to break the rhythm. Without any significant obstacles, this is the kind of sportive you can enjoy; many entrants rode with dispositions as sunny as the unexpected September weather, adding to the ride-long convivial atmosphere. However, with this ride heading deep into Footballers’ Wives country, some impatient driving left a lot to be desired; incidents of tacks on the road and a rock-throwing motorist have been reported to police. Well-manned stops at Malbank School and Kings Lock pub gave weary riders an opportunity to rest and refuel. Jaded legs and minds were also helped by a tailwind at the turn, pushing the riders north through Middlewich and Wilmslow and back to the start-finish line in Wythenshawe Park, where a carnival atmosphere was waiting. A finishing certificate, food and drink, a live jazz band and even free massages were on offer. Sportive purists may complain at the route’s lack of difficulty, but this is unashamedly a sportive focused on inclusiveness; one that still gives a deserved sense of achievement without having to kill oneself over countless soul-destroying climbs. Stood on the start-line of Manchester’s Wythenshawe Park in the dawn cool, I was full of trepidation. A woefully inadequate diet of hour-long lunchtime burn-ups had left me on a mental and physical hiding to nothing. Nevertheless, my inhibitions were quickly forgotten in the opening hour, as I over-zealously took full advantage of speeding groups, latching on to ease through sleepy Cheshire countryside villages in the wheels. Though the ride was heading onto quiet roads in the verdant Delamere Forest, there was no danger of getting lost – throughout the day, signposting was excellent, with marshals on most corners. The predominantly flat roads were a saving grace for under-prepared me, though early headwinds sections on grippy farm roads around Tattenhall proved the toughest part, briefly sapping my energy and resolve. After a much-needed stop in Nantwich, the southernmost point of the ride, to refuel just after halfway, it was back out and onto more narrow farm lanes. Things went a bit Paris-Roubaix for a few kilometres, as I concentrated hard to avoid puncturing on the bumpy, gravel-strewn roads. Soon back onto smoother tarmac, I got on terms with a quick group and, aided by the generous tailwind, the closing 40 kilometres went by in a high-speed blur. Opening fears of a tortuous mid-ride capitulation were happily proved wrong, as I dug in through the traffic-heavier Manchester suburbs and finished the event, tired but content after a fine day’s riding in the Cheshire lanes.